Prom season is about to begin and the more than 1,500 young women who waited in long lines to shop the Glass Slipper Project boutiques are all set with their dresses, evening bags, shoes and accessories. ASG Chicago was proud to be a part of this year’s boutiques, from the Curvy Girl Prom Dresses and accessories made by members, to the collecting of gently-used prom wear to volunteering in the alterations room at the boutiques. Let’s take a look at the Curvy Girl Prom Dresses, evening bags and wraps that were made by the generous and talented members of ASG Chicago. 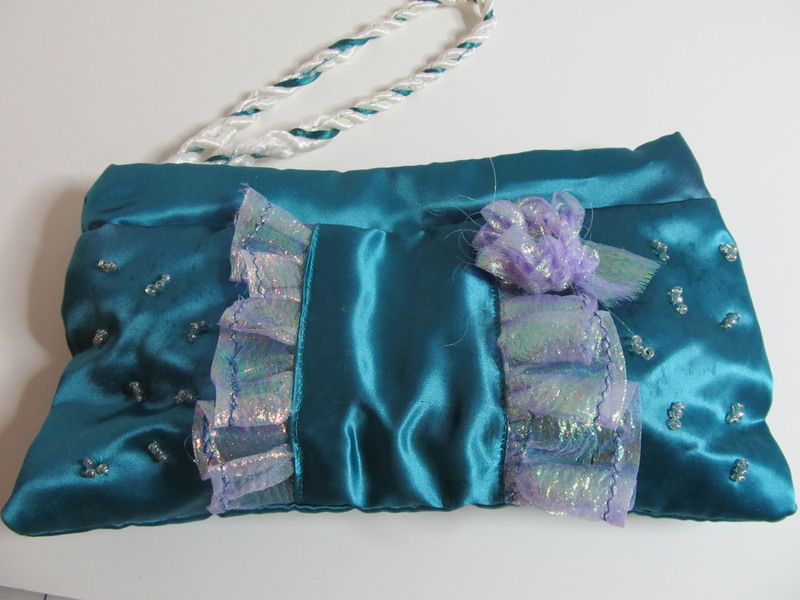 First we have a bejeweled dream of a dress created by the mother-daughter team of Carol and Jeanette. The deep blue of the sky just after sunset is graced with a chiffon overlay. The bodice is outlined in faux gemstones that will make the wearer feel like royalty. 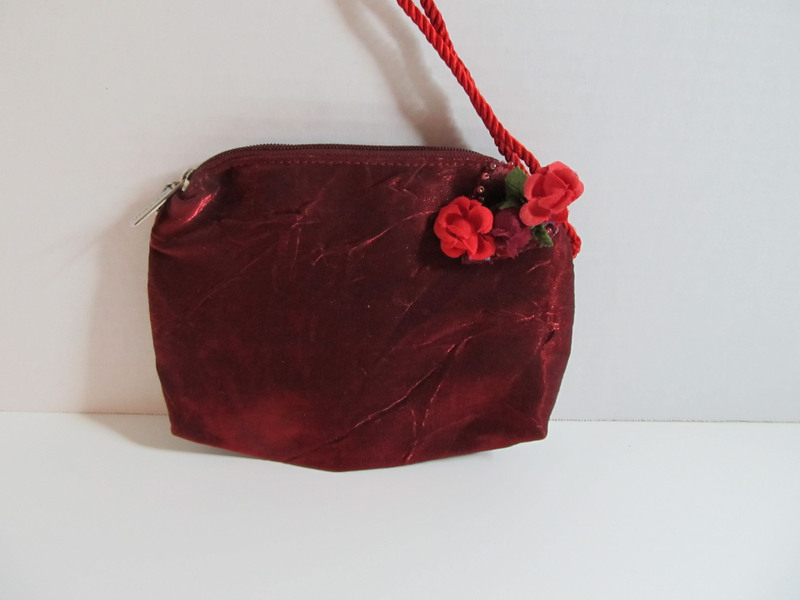 Neighborhood Group Coordinator Aileen made this confection from McCall’s 6032 out of the same raspberry-cherry hammered satin that Sew Chicago’s Nancy and Katie used for their prom dresses. 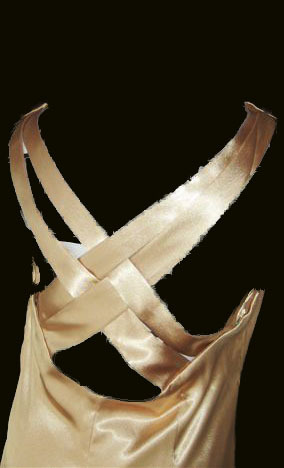 Aileen added a touch of sparkle with a rhinestone brooch holding the sash in place in front. 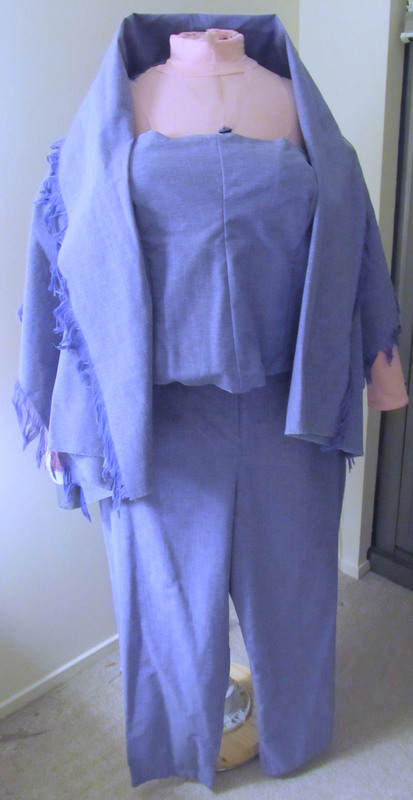 Chapter President Connie and Joliet Neighborhood Group Leader Evelyn each made ensembles using Butterick 5542. 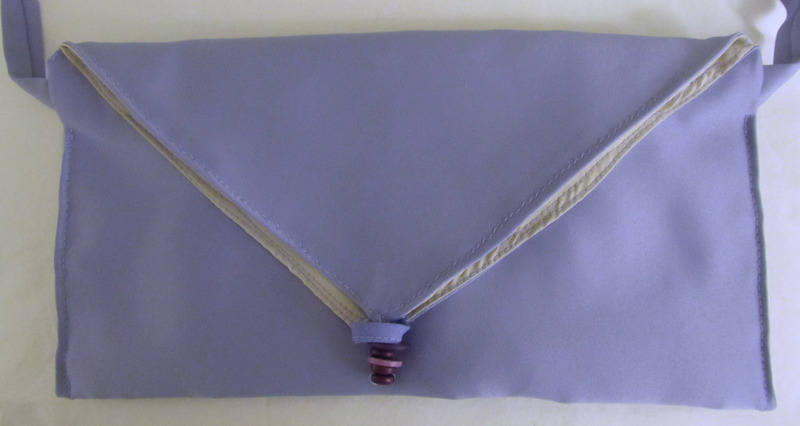 Connie chose a rich purple and Evelyn worked in a shimmery gold satin. 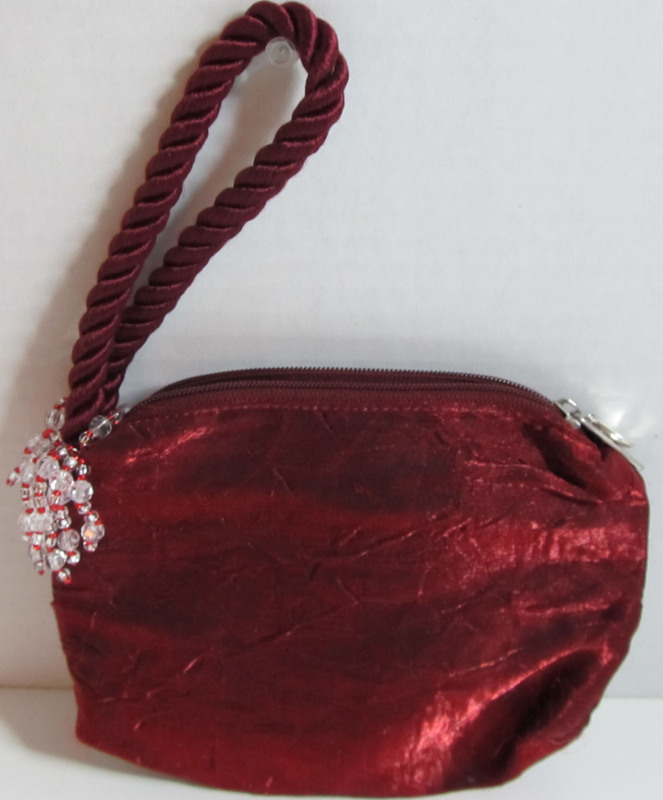 Both Connie and Evelyn made coordinating evening bags, and Evelyn completed her ensemble with a stunning brocade wrap. Community Service Coordinator Marge outdid herself, as she does with all of our many community service projects. 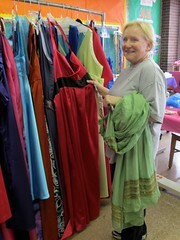 In addition to storing and organizing over 180 gently-used prom dresses and boxes of shoes and handbags, Marge made four Curvy Girl Prom Dresses. Like Marge herself, each of these dresses is sophisticated and elegant. The first is a midnight blue satin using Butterick 5461 (I used another one of the bodice variations from the same pattern). 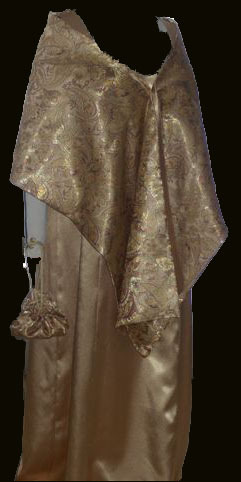 Next, Marge made a floor-length gown in a copper satin that is sure to flatter just about any complexion. For a change of pace, Marge worked in a fun print featuring lavender and blue. She rounded out her collection with a turquoise crepe trimmed in gold. Publicity Chair Carol, who brought an entire crew to the alterations room of the Glass Slipper Boutique, made an elegant full-length dress in navy with matching trim along the empire waist seam and a coordinating print scarf twisted to wear as a necklace. Pat W. spiced up the collection with a bold animal print dress. 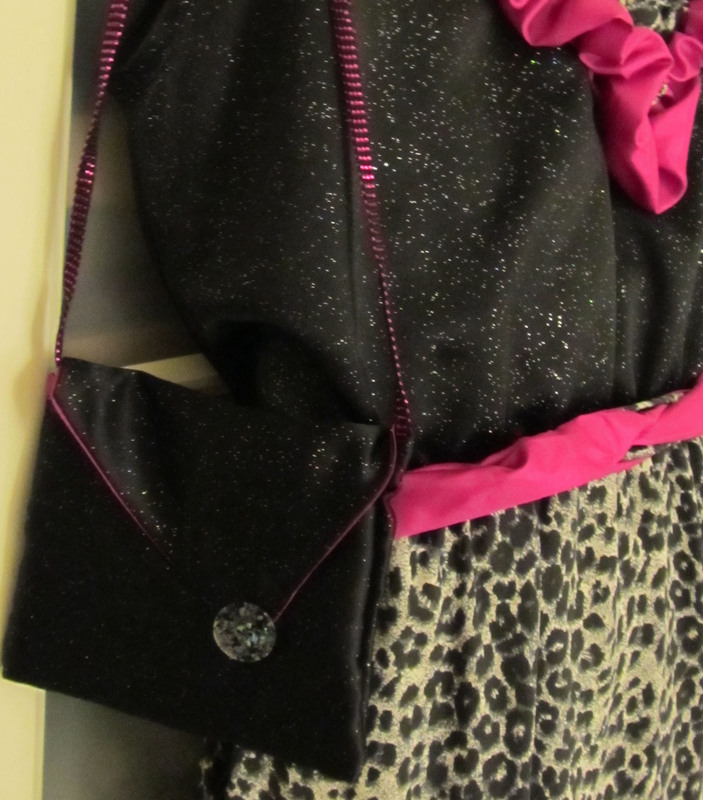 She completed her ensemble with an evening bag and hot pink wrap that matches the ruffle and sash details on the dress. 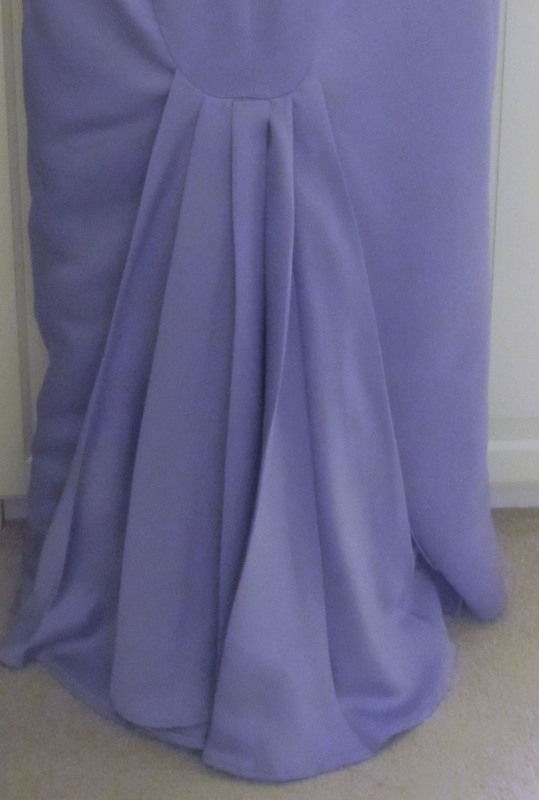 Terry from the Palos Flying Needles Neighborhood Group made this beautiful lavender satin gown that is sure to turn heads on prom night. Peggy found lavender crepe in her stash and turned out this feminine floor-length dress with a fun pleated fish tail detail in the back and a matching handbag with a clever stacked button closure. Peggy continued to mine her stash for more fabric and made this bohemian-inspired ensemble for the gal who wants to make a unique statement at prom. My apologies to Jane S., who made a hot pink dress and matching lace shrug. I thought I had an individual picture of this lovely creation, but I was mistaken. Fortunately, we have it here at the front of the rack of Curvy Girl Prom Dresses on the day we presented them to the Glass Slipper Project Board. Now for the accessories. 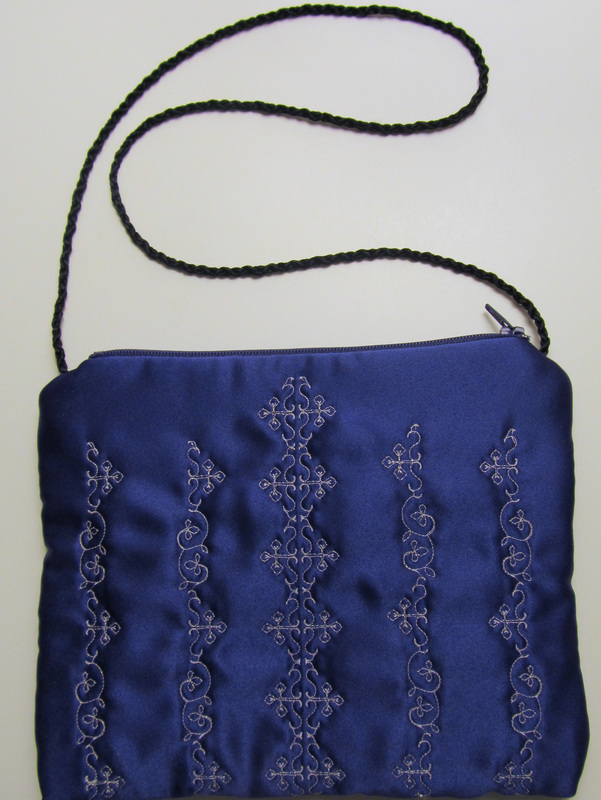 Newsletter Editor Flo outdid herself with 19 evening bags, each one with charming embellishments and meticulous attention to detail. 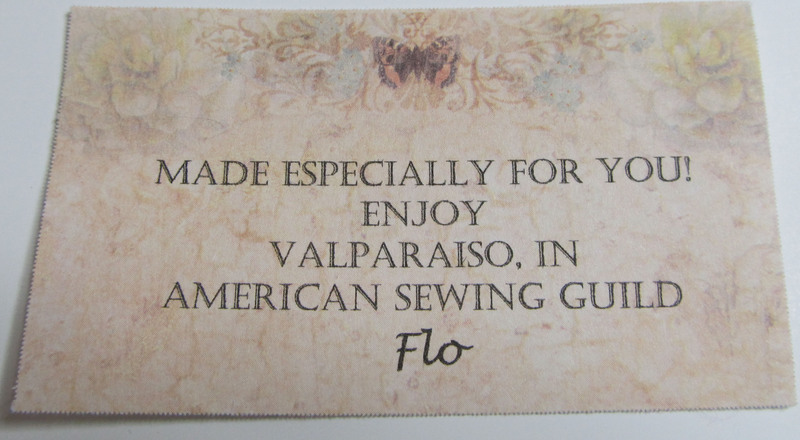 I opened one and noticed a little surprise from Flo. 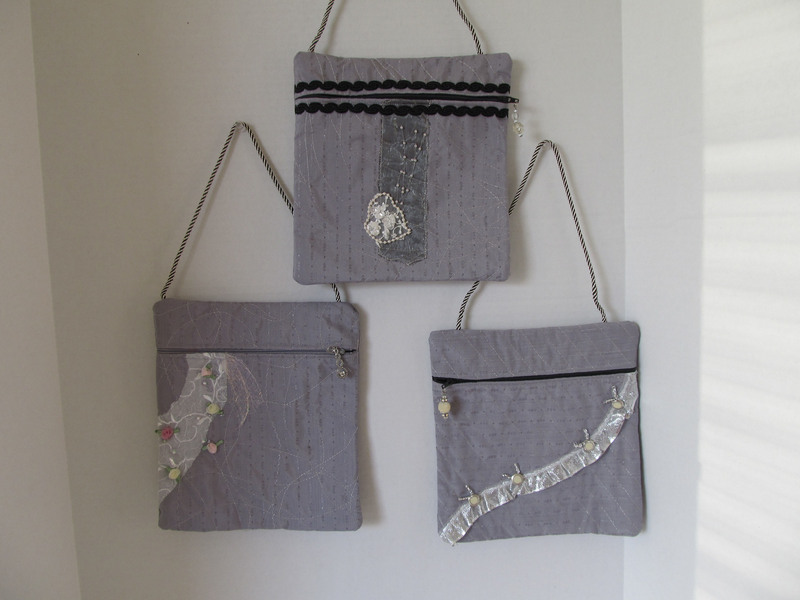 Tucked into each purse is a card with a very special message. 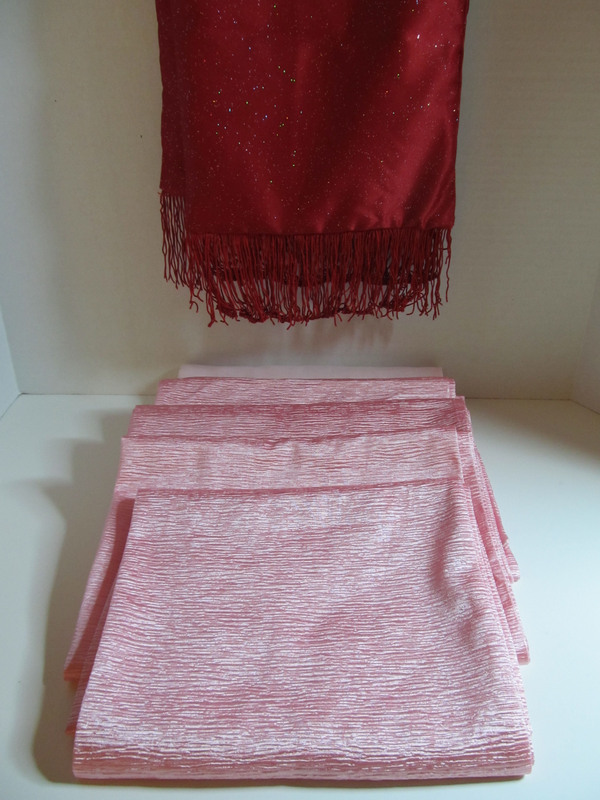 To ward off the chill of a Chicago spring evening, Lynda made four pink shawls and one red sparkly shawl. 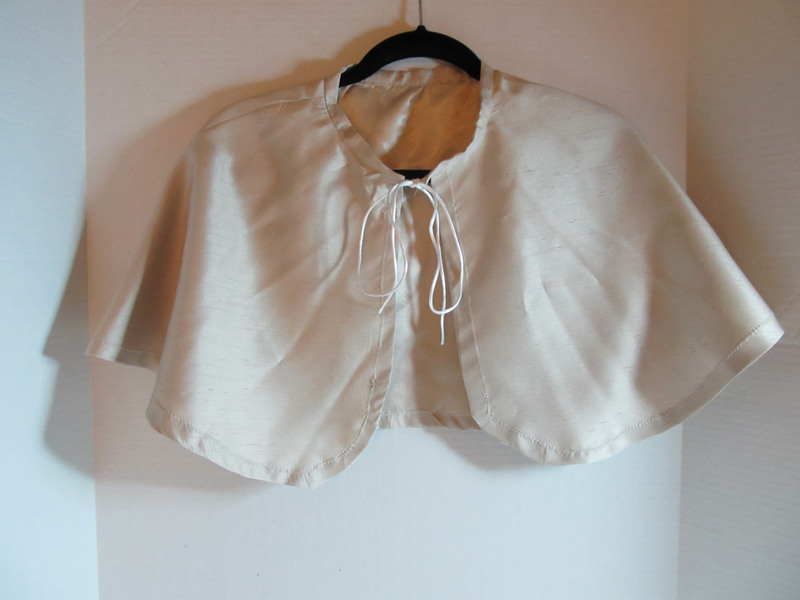 And Anna from Palos Heights made a lovely ivory satin capelet, even though she has the use of only one hand. The Curvy Girl Prom Dress Challenge also inspired Susan, a talented ASG member in Florida to participate. Her fabulous creation was on display in the ASG Chicago booth at the Original Sewing and Quilt Expo before it was donated to the Glass Slipper Project. To everyone who participated, a heartfelt thank you and congratulations on a job very well done. To those of you who missed the challenge this year, I hope we’ve inspired you to join us in playing Fairy Godmother next year. 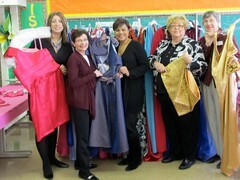 ASG Chicago presented its collection of Curvy Girl Prom Dresses and accessories, along with gently-used dresses, evening bags, wraps and evening shoes, to the Board of the Glass Slipper Project yesterday while Glass Slipper Project volunteers were hard at work setting up for the April Boutiques. The Glass Slipper Project Board members were in awe of the beautiful work done by ASG Chicago members, and the ASG Chicago Chapter Advisory Board members were in awe of the organizational feat that the Glass Slipper Project undertakes year after successful year. 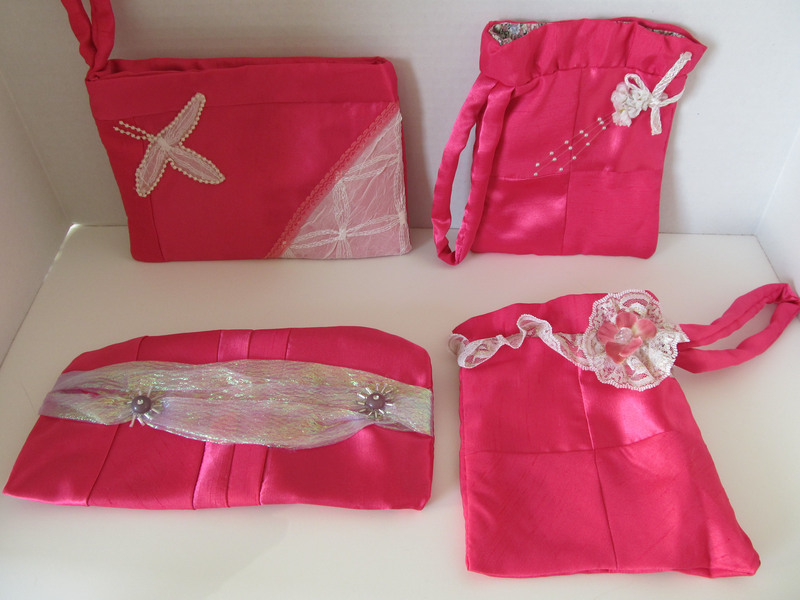 Here are some glimpses of the dresses and evening purses presented yesterday. 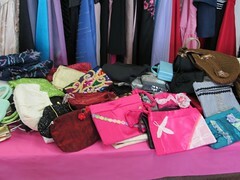 Check back soon for a post that shows each of the dresses and all the evening purses. Liz C's dress was their favorite! There is still time to be a part of this fabulously rewarding project. Sign up to volunteer as a personal shopper or to help in the alterations room at the boutiques, which will be held on the first three Saturdays in April. The link for volunteering is on the Glass Slipper Project web site. If you looked at the TribLocal.com site and read the article “Prom Gowns Needed”, you probably wondered what happened to the picture that identifies people in the photo? Well, here it is. (From left) Terry Kowalski, an American Sewing Guild member from Palos Heights, Sue Haas of Susan Marie's Sewing Center and ASG member Pat Willfinger of Oak Forest display recently-donated gowns. 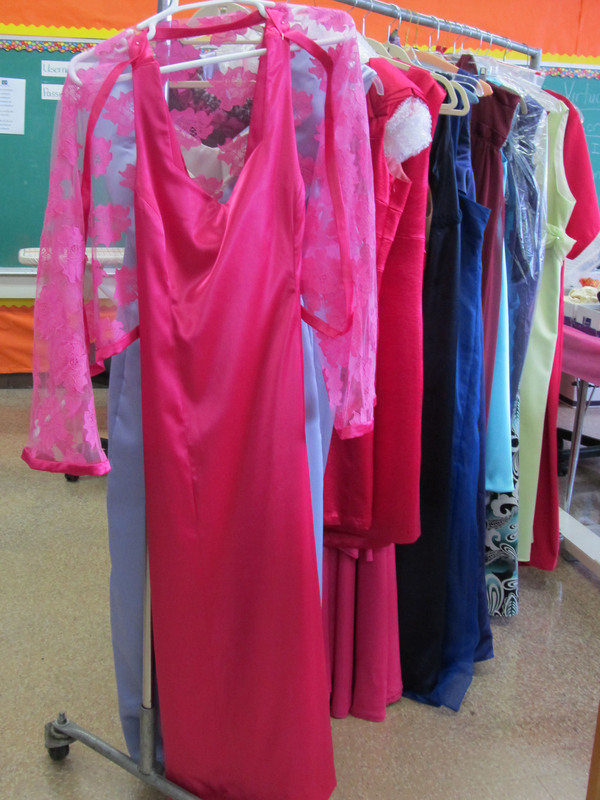 Susan Marie’s Sewing Center has volunteered to be a drop-off location for prom dress donations to support the ASG Chicago’s community service effort for the Glass Slipper Project. 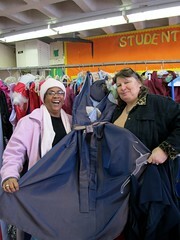 Our primary effort is to make large-sized dresses for the Curvy Girl Prom Dress Challenge. The chapter is also collecting gently-used dresses, shoes, handbags and accessories for our donation to the Glass Slipper Project, which is where Susan Marie’s Sewing Center comes in. Susan Marie’s Sewing Center is not only collecting pretty prom dresses, but donors can also drop off dressy fabric and trims to be made into additional dresses…if not this year, there’s always next year’s young ladies to dress. We’re thrilled that local sewing shops like Susan Marie’s Sewing Center is helping us make the prom dreams of young women come true. 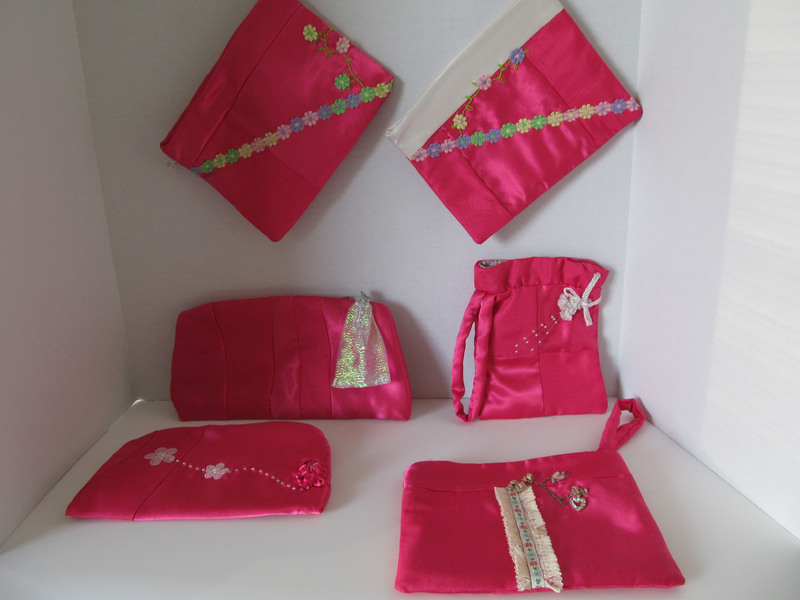 Susan Marie’s Sewing Center is also a supporting retailer of the ASG, so drop on in; say “hello”; and don’t forget to show your ASG card for your 10% discount. 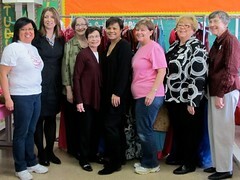 Thank you Susan Marie’s Sewing Center!